Every racetrack is different. They have different personalities and varying facilities. We work around all the unique "challenges" they invariably throw at us, for instance we'll bring different electrical adaptors to circuits around the world (or just build them onsite), air and water hose connectors, and when you're dealing with full length semi-trucks, you learn to cut it close so that everything ends up perfectly in its place. 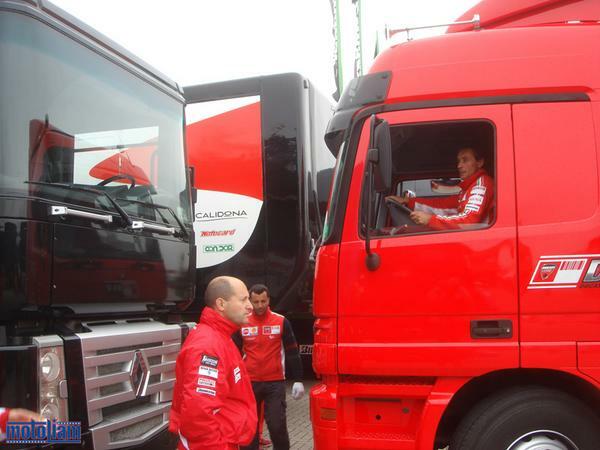 There are so many big trucks in MotoGP, everyone has to enter and exit through the same gates and it gets a bit tricky maneuvering the beasts around. I've seen them come within inches of one another when passing through the paddock, but the drivers are professionals and accidents rarely happen. Now that I think about it, Corny from Kawasaki is running around with only nine toes because of an accident, but other than that, I don't know of any other serious mishaps since I've been in the series. That's pretty amazing considering the mileage we cover week in and week out. Other neat factors that can influence a circuit? The weather and the time of year we go there. Phillip Island in the summer/winter is always a treat (remember, their season is backwards to the rest of the Northern Hemisphere, and their toilets flush reverse, too), and Malaysia and Qatar always seem to be hot, even though we go there as far from summertime as possible. 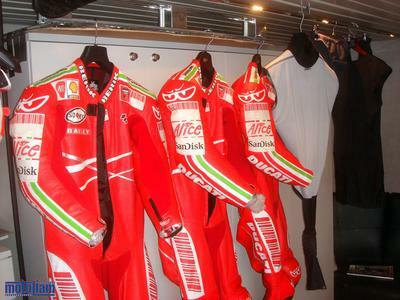 No matter how Dorna/FIM try to arrange the schedule, the weather is usually unpredictable, as we've seen several times this season. Some mornings in Assen were absolutely beautiful. Other parts of the day, however, were downright miserable. Scampering through the paddock trying to keep your socks dry while you run for lunch is just part of the game, hahaha :) It's funny, but amongst the fraternity of Parts Guys in MotoGP, we tend to wear shorts quite a bit - something about anti-voodoo, or a superstitious way of preventing rain. Obviously, it hasn't been working, so I went back to wearing the long pants for the race. And speaking about eating at the track, on Tuesday before our hospitality unit was set up, we ate at the paddock restaurant, which was cool! 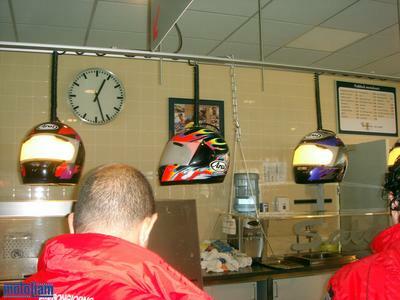 They had old helmets being used as light fixtures, and loads of pictures/posters on the walls, not to mention a gigantic "tanker" keg of beer that looked more like a propane refilling station. I even managed to get some Ben and Jerry's ice cream there, which was a real treat because we never get ice creams at the track. 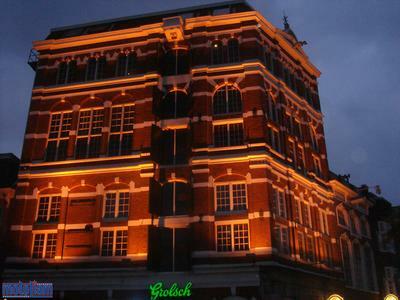 Another cool building in Groningen, close to a neat lounge called Pande48. Check it out if you're there. 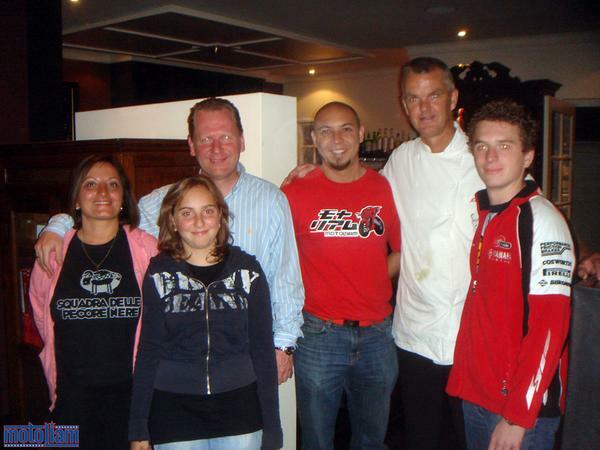 And we caught up with the Aprilia crew of Giorgio Lorenzo one night in a Mexican restaurant . 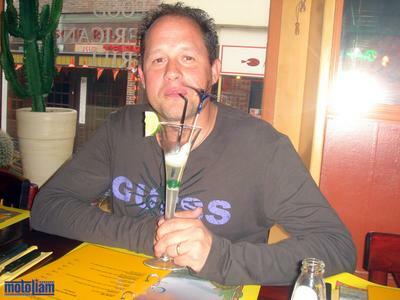 . . with their Ohlins technician drinking a decidedly fruity margarita. This guy is responsible for making the bike go up and down, which is really more complicated, and oddly, more simple, than it seems. See? 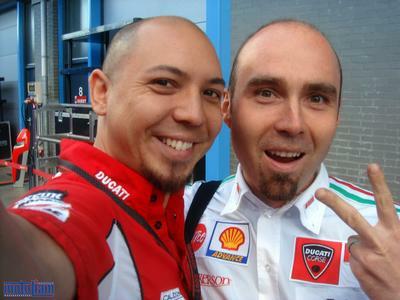 We look totally normal away from the racetrack, when we're not wearing the uniforms, haha. Look for a special feature/post on Ohlins in a couple weeks when I get everything together. The track technicians are great guys, and have they got some stories to tell. Quick shout out to Thomas, the Ohlins engineer who designed the current shocks being used by a couple Factory Teams. 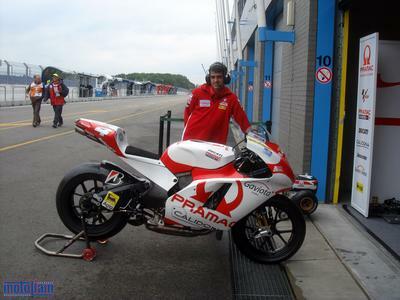 Thanks for joining us at Assen and explaining quite a bit about how things bounce to me. Because most of the other official Teams have a dedicated suspension engineer working closely with the them, Thomas jumped into our garage and was able to listen to the riders and provide excellent feedback and suggestions using - GASP - a computer program. You would not believe how cool this was, and seeing it in person blew me away. The Ates family from Antwerp rolled to the track bearing a new banner, with all the right stuff! My crew joked that I had stayed up all night painting it the night before, but really, it was Ashley and Bryan, along with their parents, Kathy and Lex, who deserve all the credit. This was really something, and one day I'm going to mount it in my garage/apartment (hint hint, hahaha). 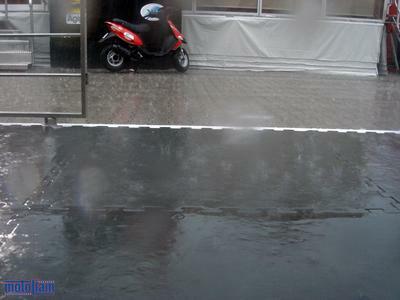 The Hoff was riding really well in Assen, no matter what the conditions were. He sat in third and fourth for a long time during Qualifying, and on Sunday's warm-up, he was tearing it up! The bike didn't quite work for him during the race, though, but he brought it home with another solid finish and stayed close to Nicky Hayden in the overall points chase. We change engines every week, as does every other team, and I might have mentioned that I can almost tell the time of day when I hear certain bikes firing up on Friday or Saturday afternoon. A small crowd gathered around Casey's #27. But no one came to check out our bike, which was roaring away at the same time. That's fine, because I prefer to be the dark horse that no one is expecting. NEVER let them see you coming. Incidently, Loris is looking for a Ford GT500, hardtop. He wants to do the Shelby conversion to 725+ Horsepower and have the car sent to his home in Monaco. He says wants it in any color but red - Maybe too many Ferraris in the garage? 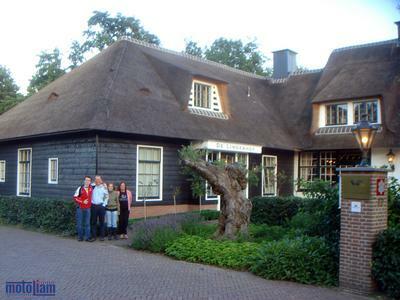 I had the extreme pleasure of being able to spend some quality time with the Ates one night, and we had planned to go to a nice restautant in the Drenthe area, about 40 minutes from the circuit. Little known fact about Holland, they have artifacts and large stone structures that date back 5000 years, similar to Stonehenge, but even Dutch people don't really know about them. We were too late at night to check any of them out in person, but hopefully another year rolls around and I'll get the chance then. Our first choice restaurant was also closed early (why am I on such a Spanish schedule for eating?! I'm even meeting people at 9:30 tonight before heading out for pizza! ), but Lex remembered a town that he had partied in after an Assen race twenty-sum odd years ago, and we headed off in that direction. We got off the freeways and into suburbia, which revealed many beautiful homes and even more waterways. Seeing the little villages was great, much better than freeway miles and empty fields, and the homes reminded me of cottages. Eventually, we made it to De Lindenhof! We had no idea what to expect, still reaking of the racetrack and wearing t-shirts, but we joked it was going to be a fancy place. WERE WE RIGHT! Just checking out the Land Rovers and Mercedes in the parking lot gave me an idea of what to expect, but the building itself was fantastic. You can't really see it in the photo, but the roof was covered with straw, which is an expensive way to go considering that you must replace it often due to water damage. It was simply beautiful, much like the waitstaff of tall, young blondes, hahaha. 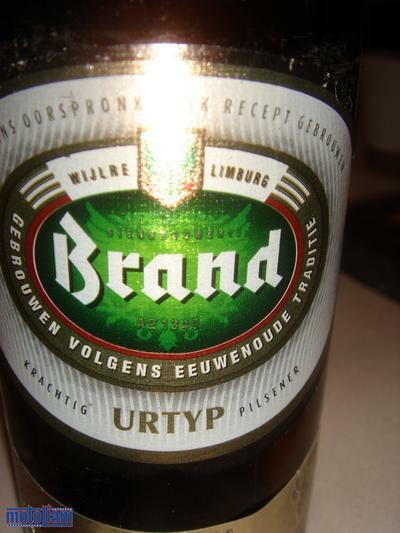 I tried some no-name Brand of beer. It was crisp and refreshing. But nothing could have prepared me for the delicacies we would be having for dinner that night. 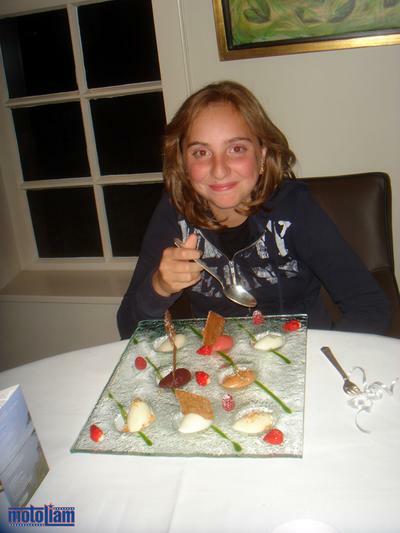 The food was amazing, and I chewed slowly to savor every moment. 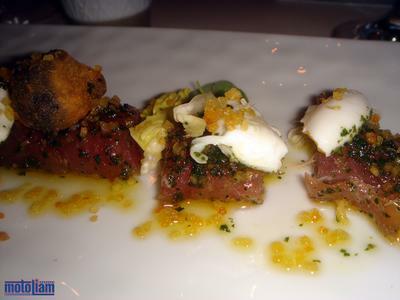 From eel, to escargot, to duck pate, to all manner of unique combinations, the chef really never made a mis-step. I was in heaven, but what really set the dinner off what the company. Because I'm always on the road with the Team, or flying solo in Barcelona, I don't really have a chance to spend time in a family environment, and it's something I really miss. I love the interaction between parents and children, and when you've got a family that loces racing as much as the Ates, it's always fun to listen to them compare riders and bikes. Everyone has a favorite, and the dual heritage of the family, half Dutch and half Italian, means that they can pretty much root for anyone - even John Hopkins! Kathy, the mother, taught me a bit about the Milan/Inter-Milan football rivalry, and everyone had a good chuckle when we tried to explain why we are such sports fanatics. We just are. 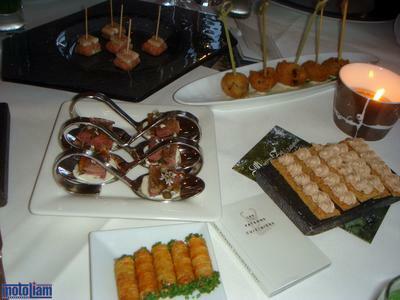 Now feast your eyes on this beautiful presentation and kick yourselves for not being there! If there was one strange moment to the dinner, the pre-dessert was it. 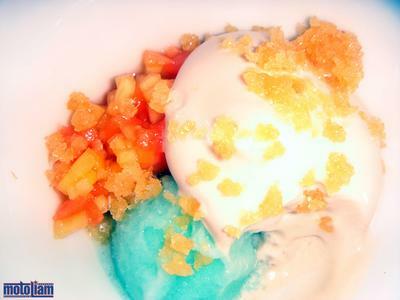 A lychee sorbet with some special heavy cream . . . . topped by Pop-Rocks? Very interesting, and it worked! Sorry I had to monkey with the colors a little on this shot, it was nearly impossible for me to capture it because of all the "white" in the photo. Ashley lines it up for the win! How many different treats are in there?!? Time was against us, because we were having such a good time. Before we knew it, it was close to midnight and we were at least an hour away from the hotel. We piled in the van, and seemingly out of nowhere, the freeway showed up, saving us a lot of time in the process. I guess we could have found a much more direct path to the restaurant, but then we would have missed out on seeing the life in the country, and moreso, we would have lost time talking. 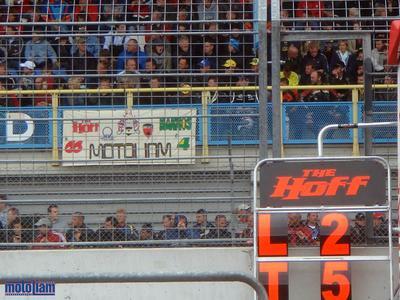 I really want to send out a huge thank you to the Ates, because this really made my trip to Assen special. 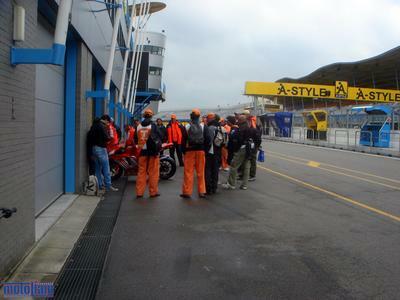 Looking forward to seeing all of you again at a future race - though only the boys are making it to Brno, hahaha. Here we are with the chef of De Lindenhof, Martin Kruithof. Oh, and meet BeefSteak. This is Gabri, from the Marlboro Team. He's one of Casey's electrical/data technicians, and he's a real asset at the track. He's come over to give us a helping hand now and then, and he mentioned that he never saw himself on the website. Naturally, his nickname comes from his area in Italy, Toscany, which is known for it's beef steaks . . . but I call him Beef Cake, hahaha. Beefy - where's my hat?!? What's up next? 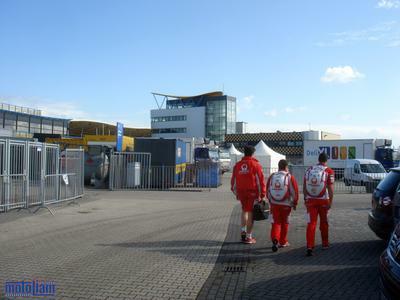 More of Assen! Yee-Haw!!! Wow, I don't know if reading here is good or bad, but it sure makes me miss living there!!! CIAO Bello!